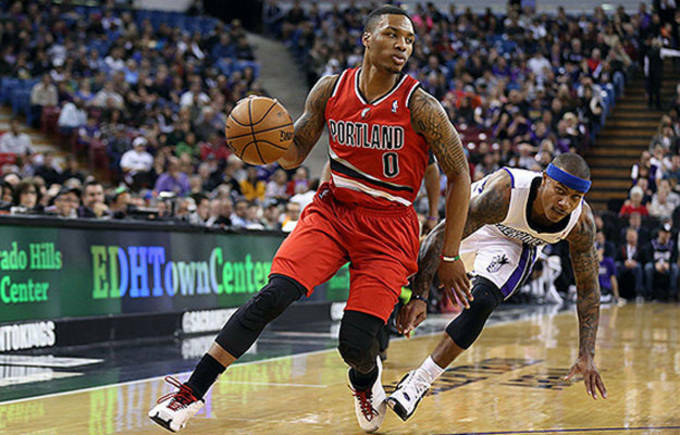 News surfaced today that Trailblazer&apos;s All Star and 2013 Rookie of the Year, Damian Lillard, will re-up his contract with adidas. This comes after news a few weeks ago that he would be opting out of his deal to test sneaker free agency. Lillard has grown into one of the leagues biggest superstars leading to the Trailblazer&apos;s to a 38-18 record so far, best for 5th in the Western Conference. 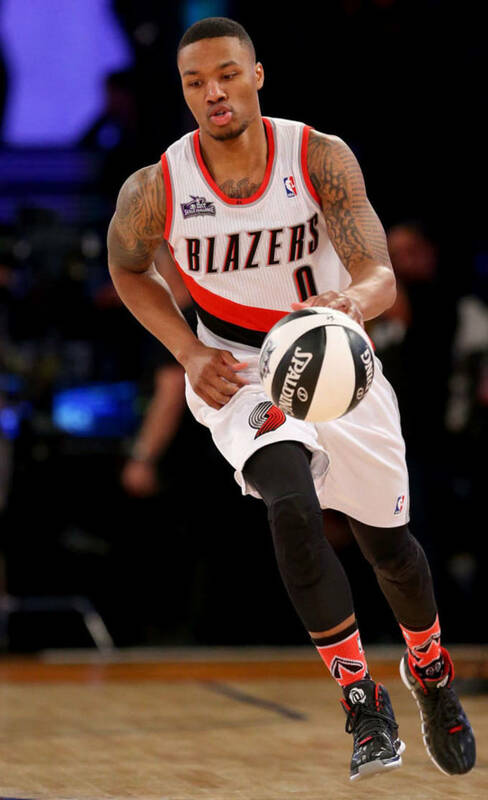 Lillard signed with adidas his rookie year fresh out of Weber State and quickly became a growing face of the company along with John Wall, Dwight Howard and Derrick Rose. Included in Lillard&apos;s deal was the right to opt out based on his success on the court, which he has fully exceeded expectations, giving him the right to become a "sneaker free agent" and garner offers from other brands or resign a more lucrative deal with adidas. Here are some of his greatest moments on court while sponsored by the Three Stripes, may the good times continue. Danny Mitchell is a freelance writer from New York and contributor to Sneaker Report with a obsession for the Knicks, sneakers and all things 90′s. He can be found on twitter @dmitch_23. 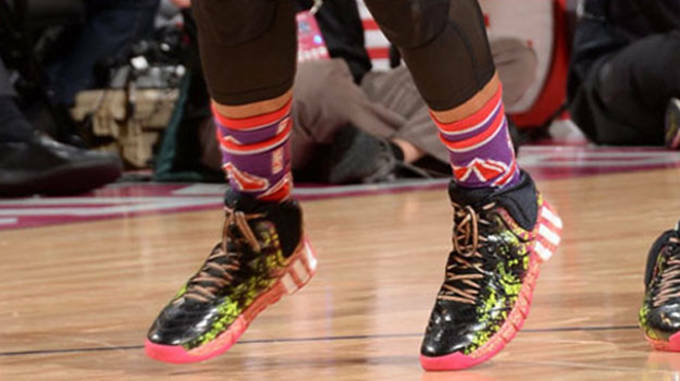 Stars in the 2013 BBVA Rising Stars Competition Rocking the adidas Crazy Fast "All Star"
Lillard laced up the adidas Crazy Fast "All Star" for his run in the 2013 BBVA Rising Stars Challenge at All-Star weekend in Houston. Lillard and Team Shaq got bested by Team Chuck, led by 40 points from Kenneth Faried, but Lillard played well in his first of many future appearances to come at All-Star weekend. 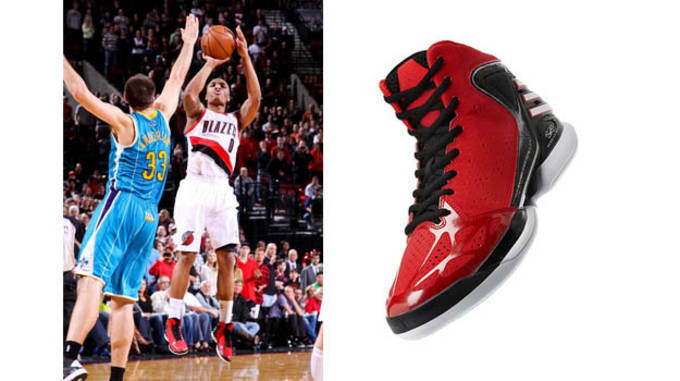 Hits Game Winning Layup Against Suns in the adidas Rose 3.5 "Home"
Crushes the Pistons Dreams in the adidas D Rose 4.0 "Brenda"
Lillard Does it Again in the adidas D Rose 4.0 "Brenda"
In back to back game&apos;s, Lillard came through when it counted most. 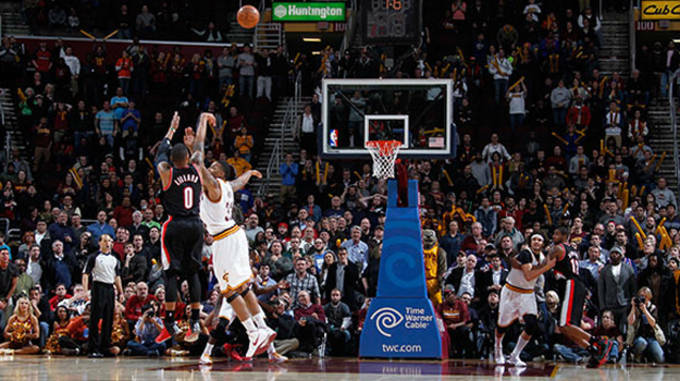 Following up a OT game winner just two nights before in Detroit, Lillard shined in Cleveland in his premier matchup against another upcoming superstar point guard, Kyrie Irving. 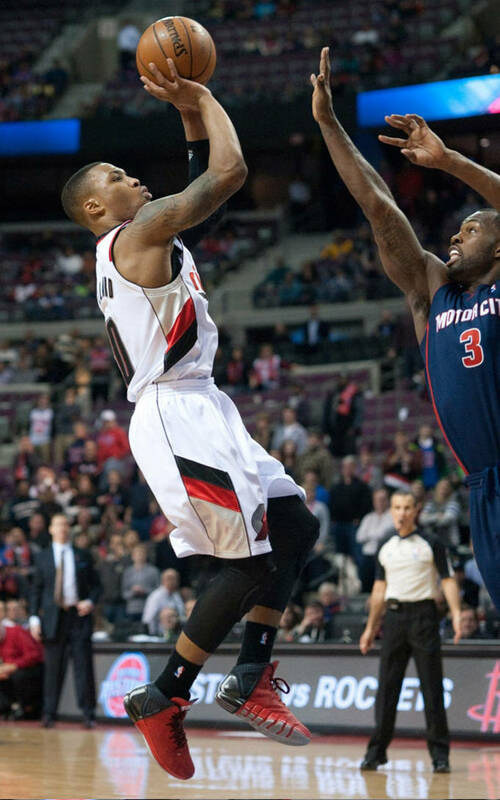 Lillard dropped 36 points and flirted with a triple double, falling short by just 2 rebounds. 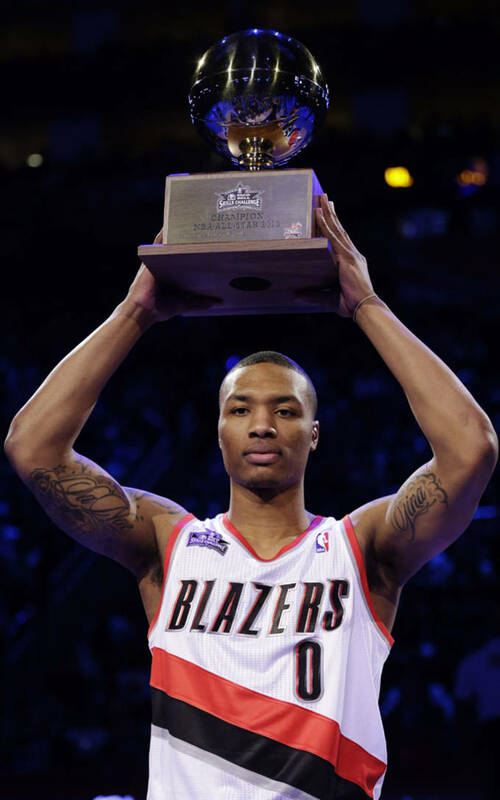 With ice water in his veins, Lillard walked up the three point line and drained the game winner over the outstretched hand of Alonzo Gee and led the Blazers to a then NBA best 22-4 record. Not the usual stat stuffing game for Lillard, but in his excessively busy All Star weekend he still did his thing in the 2014 BBVA Rising Stars challenge. 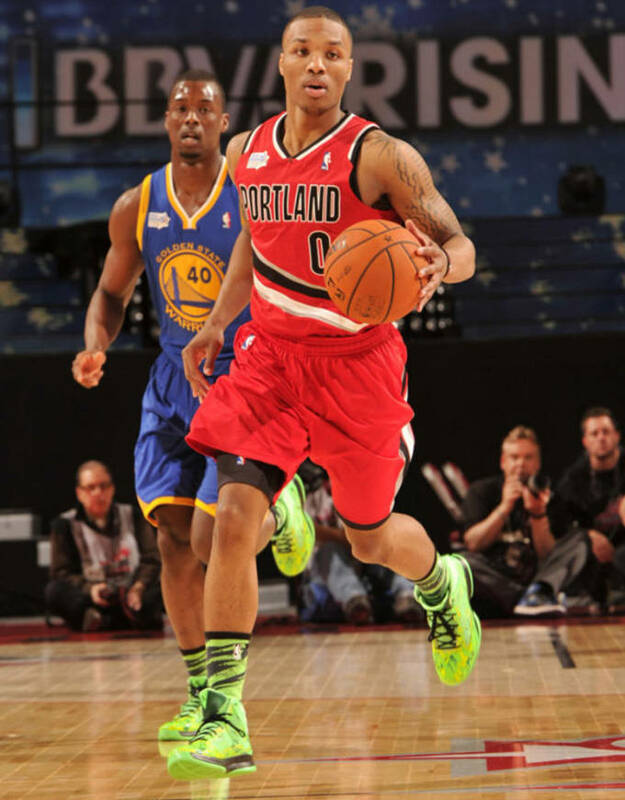 Rocking the "All-Star" adidas Crazy One, Lillard took it easy and acted as a facilitator after going only 1-5 from three point range. 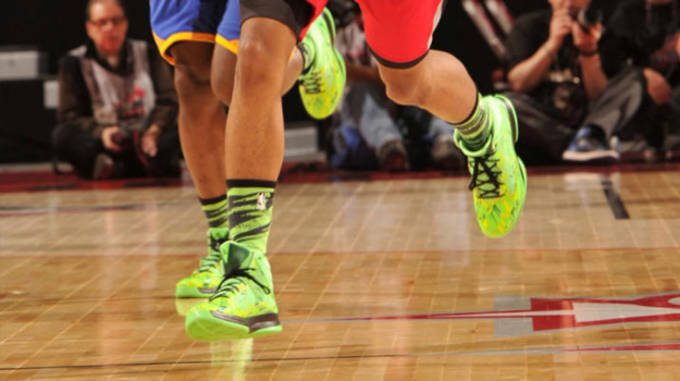 Not his greatest game ever, but was certainly at the top of his sneaker game that night. 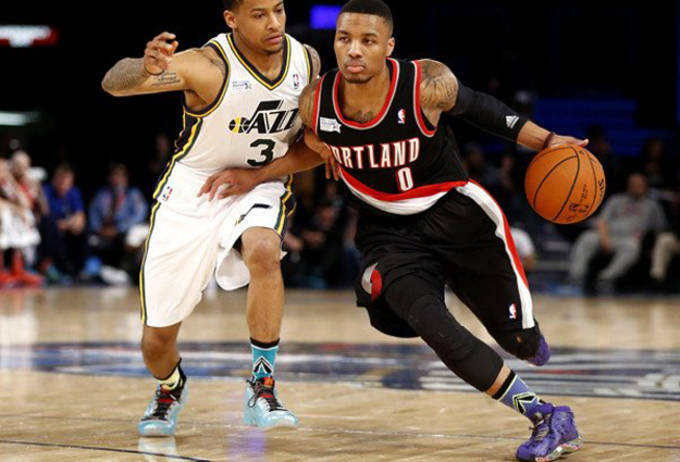 Lillard Wins Second Consecutive Skills Challenge in the adidas Rose 4.5 "Away"
Lillard and Utah Jazz point guard Trey Burke teamed up to represent the Western Conference and took home the 2014 Skills Challenge championship. This marked the second consecutive Skills Challenge championship for Lillard, as he tried to differentiate himself and prove to the league he&apos;s a complete player. 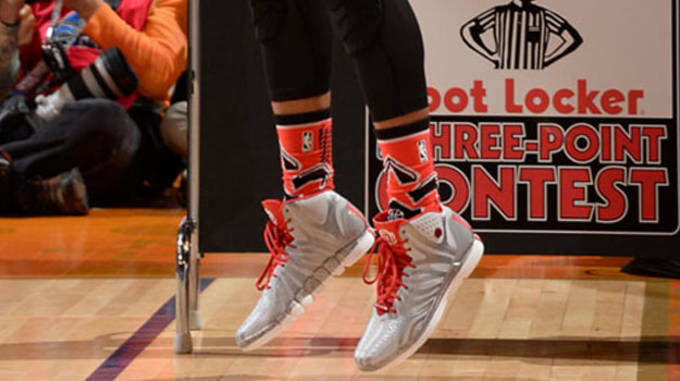 Lillard switched over to the "Home" adidas D Rose 4.5 to compete in the 2014 Foot Locker Three-Point Contest. The switch didn&apos;t work out too well as Lillard was bested by just 1 point by Spurs shooting guard, Marco Belinelli, who advanced to the finals and eventually beat out Bradley Beal. Lillard had a solid shooting and will most likely join the contest again next year to prove he&apos;s one of the leagues guest shooters. 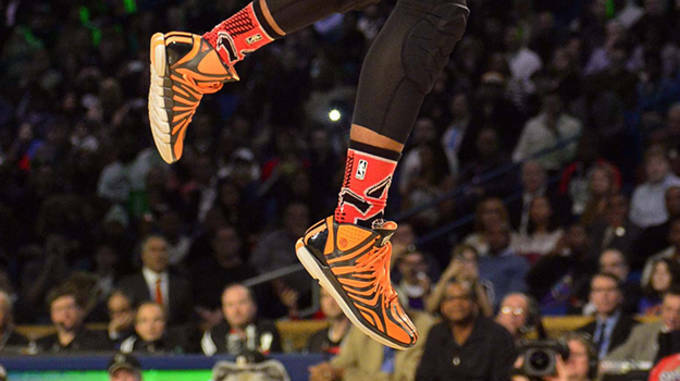 Lillard Shows Off His Hops in the adidas D Rose 4.5 "Tiger"
In the premiere event of All-Star Saturday night, Lillard showed up in the adidas D Rose 4.5 "Tiger" to prove he could get up with the best of them. After some impressive dunks in the "freestyle" round, Lillard brought out a between the legs, reminiscent of Vince Carter, which many people didn&apos;t think he was capable of. We may be seeing Lillard again in future dunk contests as many felt this year&apos;s format didn&apos;t give each dunker enough chances to show off what they had in store. 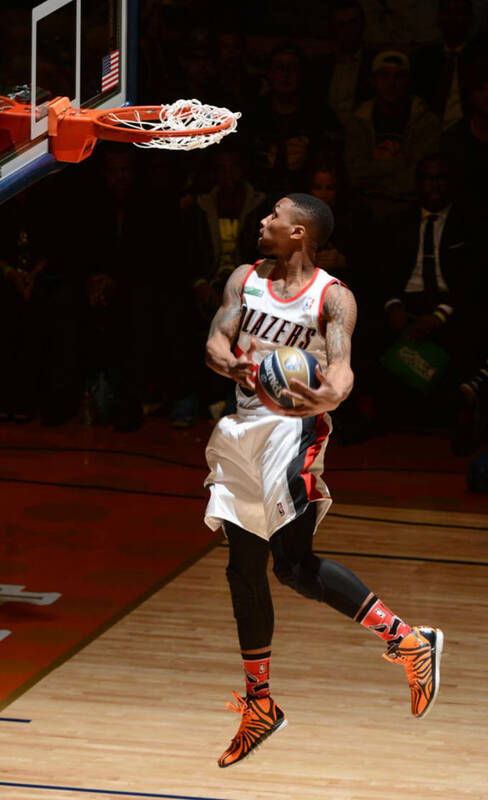 In his first All-Star game appearance, Lillard only got 9 minutes but made them count scoring 9 points on 3-8 shooting scoring all his points on three pointers. 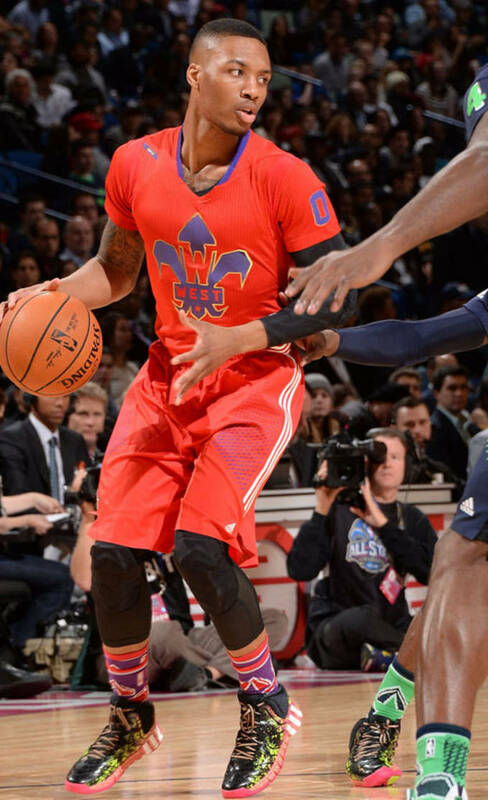 In his first of many All-Star selections to come, Lillard brought out the adidas Crazyquick 2 "All-Star", as he competed in his 5th event of the weekend, making him the busiest man in New Orleans for the weekend. If Lillard continues his career on this path, there&apos;s plenty more All-Star appearances on the horizon and could be starting in the years to come. In possibly Lillard&apos;s greatest game as a pro to date, he put up an impressive 41 points in a losing effort to the struggling Kings. 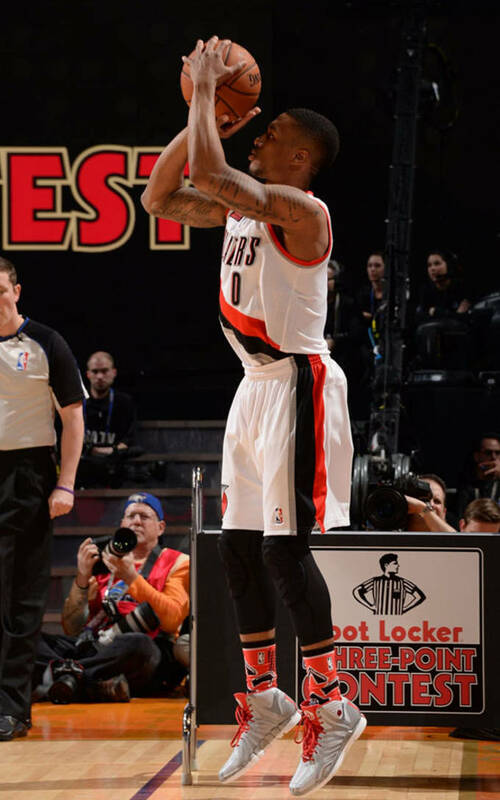 Lillard led the Blazers with 41 points on 13-24 shooting, including splashing in 7 three-pointers. Starting the game out in the adidas Crazy One "Stormtrooper", Lillard must of not been feeling right and switched into the adidas D Rode 4.5 at half. 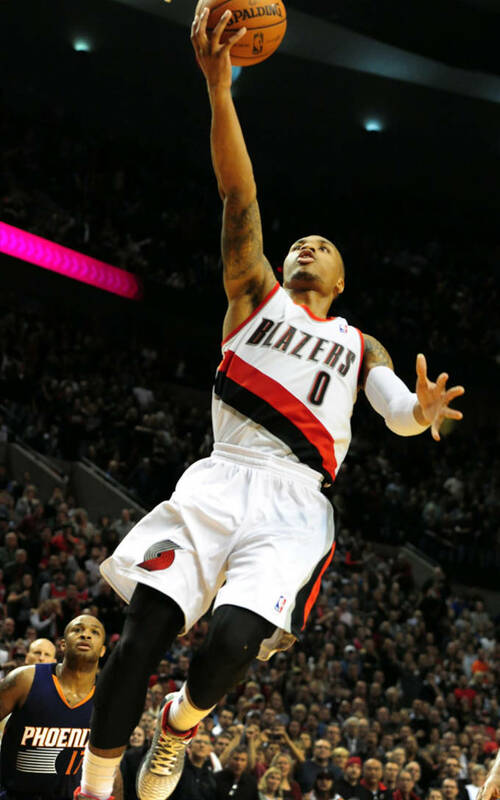 The switch seemed to help as Lillard erupted in the second half including scoring a Blazers record 26 points in the fourth quarter. The effort came in vain as the Blazers lost to the lowly Kings, but this should give fans even more certainty they have a super star point guard of the future in Portland.